Our tiny Hong Kong room. From Beijing we took a train the whole way down to Hong Kong – our 60-day China visa was issued as a dual 30-day, meaning we needed to exit the country in the middle of our stay and come back. Hong Kong of course is technically the same country these days, but you still get your passport stamped and it allows you to start the 2nd part of the visa. We decided to stay for a few days and spent four nights on the Kowloon side in the smallest room we ever stayed – 1.45 meter wide including the bed and as long as the bed plus a small bit where the door opened – maybe 3 square meters excluding the bathroom and not much more including it. Showering had the option to lean over either the toilet or the wash-hand basin. Quite an experience and at 20 euro/night a total bargain for Hong Kong! Hong Kong in general is a funny place, smells of money more than anywhere we’ve been with tall skyscrapers and electronic stores everywhere selling the very latest gadgets. English is spoken everywhere which we’re not quite used to after China and the people are much more mixed – there are many Indian merchants on the street who, bringing the Delhi style of business with them a little too much, ask you if you need a suit or a tailor roughly every ten seconds. Luckily they don’t all work as tailors, and we had some great Indian food a couple evenings. Also found some very good sushi and dim-sum breakfasts. We caught an omnimax movie in a space museum one day, and went over to the main Hong Kong island to go to Victoria peak for the famous view over the skyscraper jungle one night, though they were in the process of closing off the viewpoint because of typhoon risk when we were there… We had seen “Typhoon signal 1 hoisted” signs the first day when we arrived, changing to signal 2 the day after and then 8 the day before we left. Never saw more of it than some rain and a restless wind changing direction all the time, think Taiwan got the worst of it. 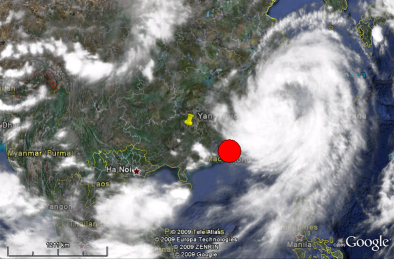 Google Earth screenshot of the near-miss..
More fun on Hong Kong – they’re completely paranoid about germs! There’s messages in the subway warning about them, notes in the elevators that the floor buttons will be disinfected every two hours, and disinfection mats at the mall entrances where they ask you to rub your shoes. They also love air-condition here and blast the living daylight out of it where-ever it’s available – meaning that you spend a day in town constantly alternating between 15 degree C and 35 degree C…pretty taxing on the body and makes it easier to get sick, but of course lets blame the germs and be paranoid about them! Night view over the Hong Kong cityscape from Victoria Peak. This entry was posted on Saturday, September 5th, 2009 at 5:00 pm	and is filed under Uncategorized. You can follow any responses to this entry through the RSS 2.0 feed. You can leave a response, or trackback from your own site.